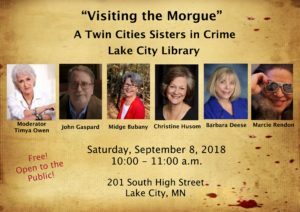 "Visiting the Morgue," should bring out some great discussion. With fellow authors Midge Bubany, Barbara Deese, John Gaspard, Marcie Rendon, and Timya Owen, Moderator. 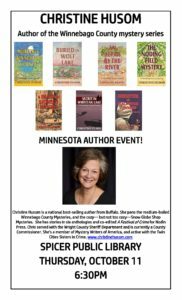 I'll be at this 21st Annual Event with my books for the first time. It looks like there will be a wonderful variety of items! I'm looking forward to meeting the good folks in Winsted and sharing my story. Join us! I'm looking forward to meeting members of a Book Club to discuss my books and writing process. And they've invited the public to join us. We'll have fun! I'll have a table with my books and also be on an author panel at 10:30 a.m., "It’s a Mystery to Me": Authors describe the writing process—getting that first idea, creating characters, doing the research, and the daily writing schedule that gets it done, with Mary Angela, Jeff Falkingham, Julie Seedorf, and moderated by Timya Owen.